When I press F10 then "A", don't go to the Advanced Settings. Makes no difference if I click "A" after F10. Already tried several times. The bios version is F.48. My pc is HP. I don't have admin password. The bios is like the image above, but do not have all these configurations, only has the BOOT. some guy seems to have solve this by making a mod (some other ppl with F.48 also complained my easy method failed for them). mine is F.0C and i dont know whether that is really a good one ... i entered a validation key and i got an error message like , the BIOS is missing the required license, help please. sorry, dude, I don't know the solution to your situation. maybe you should try search for a mod version of that BIOS. It didnt work with my Insyde F.22 bios. I cant find a mod for this bios. Any help? Need to access the ACHI settings. Sorry dude, you might want to post your request to some BIOS mod forums. I am not active in that community myself. do you know if I can update my bios to a different verison, like if I have F.22, can I flash it to F.26? Hi there. I have an Acer Aspire 5733z model laptop with Windows 7 Home Premium on it. And I also have an Insyde bios as well. But I do not have a Power tab or any of the other options in my bios like you have. So if it is possible, can you please let me know on how to get these options for me? Or can you please Mod my bios for me? Any help would be greatly appreciated. I have an Insyde bios, and I am using a 5733z model Acer Aspire. So thank you very much. So please get back to me as soon as you can, so I can figure this all out. Thanks a lot! My experience with Insyde bios is currently limited to the one on my laptop. There are more experienced people that might be able to help you out. Try search for your laptop model and "insyde bios advanced". (unfortunately I don't mod BIOS either..) Hope you find what you need soon. i have the same model you took pic of.and same bios version but still its not working for me. I have an HP DM4-2165DX. I dont understand. Do you install a mod bios? or you can acces with the original? How exactly are you pressing your buttons? After you press F10, do you press A immediately? Do you just press A once and let go, are you mashing the A key, or do you press and hold? I have F.13 but none of these options seem to unlock the advanced menu after pressing F10 while the blue HP circle is on the screen. Yes, you need to press A immediately after F10, i.e. when the screen changes. "press and hold" or "mashing" should both work. The time window is small so give it a few tries. Didn't work. I have a Vaio VPCEL10El and the InsydeH20 rev. 3.5 bios version, please help!!! 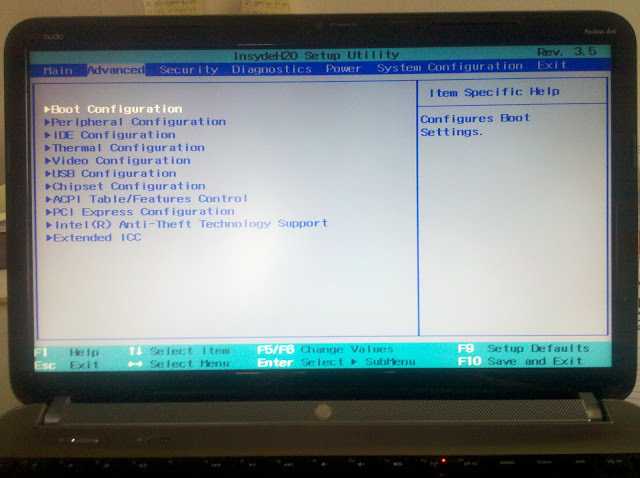 Thank you, finally after 3 years I can finally access my hp DV7-6165us bios hidden features. I can now control my dual graphics cards manually. My 6620g and 6750m. I can use the dedicated or integrated card. Also Amd Catalyst hidden feature now appear also. I have HP dv6 6165tx with same boss F. 1b but its not working..
wow you guys are something else. he said hes not a tech; someone told him a trick and it worked. obviously insyde gave the oem an option to override the override. leave the guy alone, stop being stupid and lazy, thank him for sharing and helping some of us, and get back on google. "waaa now i need to dl a hex editor..."
I have System Model SVE15114FXS sony vaio and BIOS Version/Date Insyde Corp. R0200E5, 9/21/2012, 3.7 with very limited options. F2 key gets me into bios and if i press f2 and A, it never makes difference. Why sony has given such a rubbish bios even all its laptops are so expensive? I'm just glad to find out that Insyde is a legitimate company and the BIOS is not from a hacker trying to steal my ID and credit cards. Picked up a Toshiba Satellite 655 from a flea market for $15 yesterday, and when the computer turned on and booted to Windows, I was thinking it was too good to be true. Then the paranoia set in. So I tried to get to F10 to do a system restore and F10 from the boot screen was not an option. I decided to wipe the system clean and repart the harddrive, putting a fresh copy of Windows 7 on it, only to see the restore partition. However there was no way to get to it. So I tried several ways to get to it, and found this same issue with the Advanced options not working. Wished I would have found this site before wiping all of the Toshiba software off. But then again, most companies bloat windows up so bad, most of the time I wind up wiping it anyway. I will try the F10/A option after the current batch of Windows updates install, and hopefully will be able to access that menu.